Make any occasion even more special by serving this delicious one-dish meal. 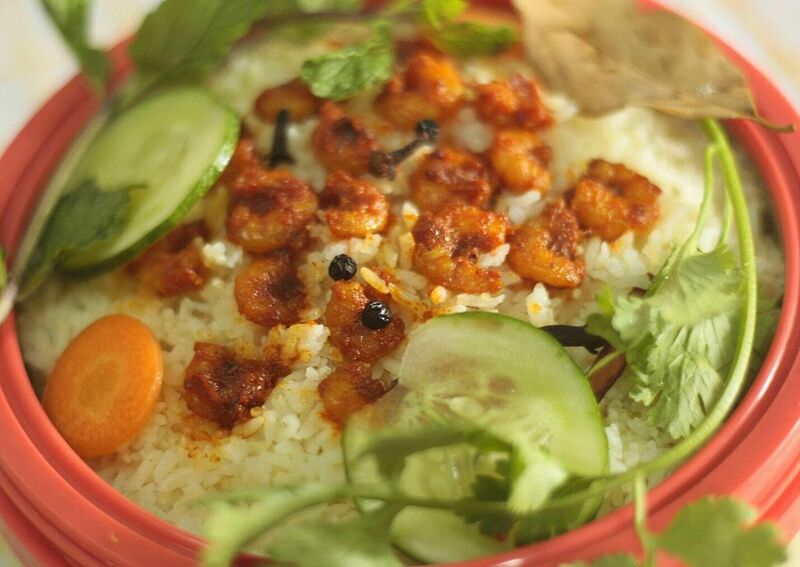 It is made up of layers of fragrant, long-grained Basmati rice and prawns cooked in a delicious blend of whole and powdered spices, cooked to perfection. Biryani takes time to prepare and the list of ingredients may seem endless, but it is totally worth the effort! Besides, the ingredients are all common ones used in Indian cooking, so they're easy to find in your local supermarket or Indian food store. Biryani may not freeze too well but it will keep for day or two in the fridge and tastes even better the day after it is cooked. Jhinga Biryani goes really well with a green salad and raita of your choice. Put the rich in a fine sieve and wash under running water till the water runs clear. Now put the rice into a deep bowl and fill the bowl with enough warm water to fully cover the rice. Soak for 30 minutes. After soaking, put the rice in a deep pot and add enough water to cover the rice and 2" above it. Cook the rice on medium heat until almost done - to test, squeeze a few grains between thumb and index finger. They will be squishy but will not fully mash. Drain the almost cooked rice through a sieve and keep aside. Marinate the prawns in a deep, non-metallic bowl, by adding the yogurt, lemon juice, turmeric powder, ginger and garlic pastes and salt to taste. Mix well and set aside for at least 1 hour. Heat a griddle or flat pan on a medium flame and gently roast all ingredients mentioned under 'For dry masala/ spice mix' till they start to become slightly darker and give off a faint aroma. Peel the cardamom pods and remove seeds. Throw skins away. Now grind all the roasted ingredients to a fine powder in a clean, dry coffee grinder. Grind the ingredients mentioned under "For wet masala" to a smooth paste in a food processor. Heat the cooking oil in a deep pan till hot and then fry 1 of the 3 portions of sliced onions until crispy and golden. When done, drain and remove from the oil and keep aside on paper towels to garnish biryani later. In the same oil, add the remaining sliced onions and fry till soft. Now add the tomatoes and fry till soft. Add all the dry and wet masala ingredients prepared earlier and fry till the oil begins to separate from the whole mix. Now add the prawns and all the marinade to this spice mix. Stir and allow to cook till the prawns are done. Do not overcook as the prawns will get rubbery in texture. Season with salt if required. Remove from fire. Soak the saffron strands in 2 to 3 tbsp. of warm milk. Take a large, deep ovenproof baking dish (it MUST have its own oven-proof cover) and grease lightly with cooking oil. Layer the rice and prawn as follows: rice - prawn - rice. End with a layer of rice. Keep a few prawns aside to garnish at the end. Pour the saffron infused milk all over the top of the last layer of rice. Garnish with the crispy fried onions, chopped coriander leaves. Cover the dish and seal tightly. Serve hot with a raita and green salad of your choice.